Storm the night before dropped about a foot of new snow covering the entire route from about the 6000ft level. 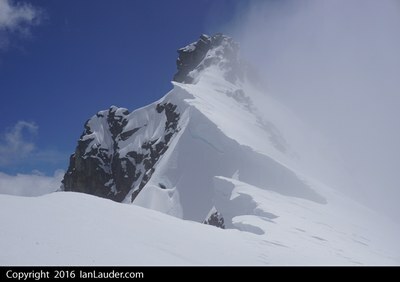 Summit block was not reachable as it was covered with new snow. 6/19/16. Our 2-day plan changed to a 1-day climb due to weather. Started Sunday 4am from the Eldorado trailhead (gate is still closed). 15.5 hours car to car, 14 miles and 6500ft gain. Snow started around the 6400ft level where the first camp area is. Fresh layer of about a foot of new snow we had to break trail through all the way across the glacier. Due to avalanche concerns we took the lowest angle approach and decided on a turn around if we saw any avalanche activity on the route. We did see some small point releases on the sun facing slopes on the way up but the climbing route had no activity and snow layer was in good shape. We almost reached the base of the rock summit block and turned around there since it was covered with fresh snow that was loose and melting. Cornices were also breaking apart in the late afternoon sun. Another party of 3 following up our boot path proclaimed they wouldn't have a problem because they brought cams and an ice tool. They turned around too.